Energy | I see Cambodia! 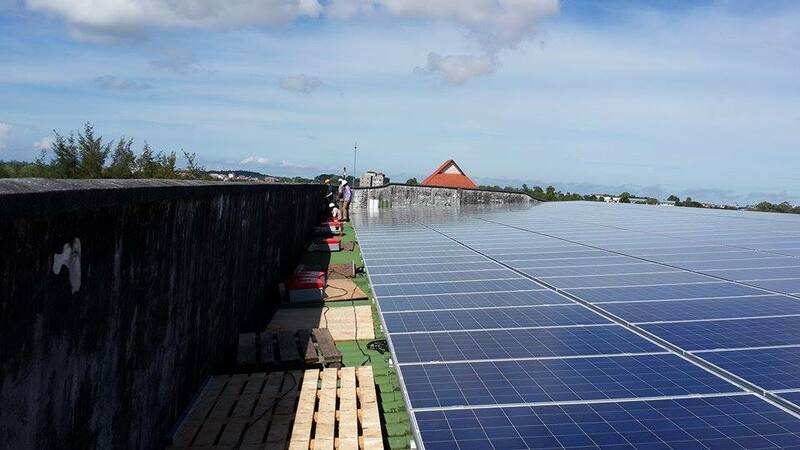 386 solar panels on 2 roofs of Don Bosco Technical School in Sihanoukville, the first large grid connected solar energy in Cambodia. It costs 130,000 Euros mainly financed by Finland. Electricity of Cambodia accepted that surplus should enter the national grid, becoming the first experience of that kind in the country. Solar energy is becoming a good alternative for a country like Cambodia and its growing development. Cambodia has to important most of his power from neighbouring countries like Thailand and Vietnam. Producing its own energy would be a key for its own development. Solar energy is not only a good solution but it goes along with the growing needs for a friendly environment system. Aspect of the Solar Plant over the Social Communication Section Building of the Don Bosco Technical School in Sihanoukville Province. The first grid connected solar plant of Cambodia.